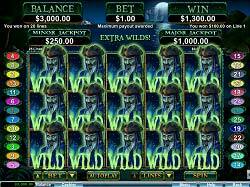 Ghost Ship New Slot Game at Sloto’Cash! Arr, it’s time to plunge into the dark waters of Ghost Ship – a new 25 and 5 reel online slot that will take you on an deep-sea adventure where you’ll be spending time with a crew, that even though met their watery grave long ago, is still guarding their treasures! You and only you can uncover these gems! Your thirst for adventure and treasure seeking thrives with symbols such as the Wild Ghost Captain that may fill the entire reel to create winning patterns. You’ll also be gathering coins when you land the scatter Ghost Ship. 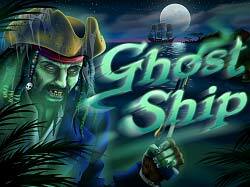 When a Ghost Captain or Ghost Ship Scatter appear, Ghost Captains may fill the rest of the reel that they appear on. In free games, Ghost Captains will always fill the reel they appear on! With 2 free games awarded for every Ghost Captain or Ghost Ship symbol appearing anywhere on the triggering game, you’ll be amassing wins quickly! Get ready to sail on through the rough seas of Ghost Ship and battling the crew over the hidden treasures found on this fantastic new slot with 20 Free Spins and a 100% Match +33 EXTRA Free spins* to be collected! Yo ho ho mates, it’s Ghost Ship time! *Offers will be published on March 19th upon game release!